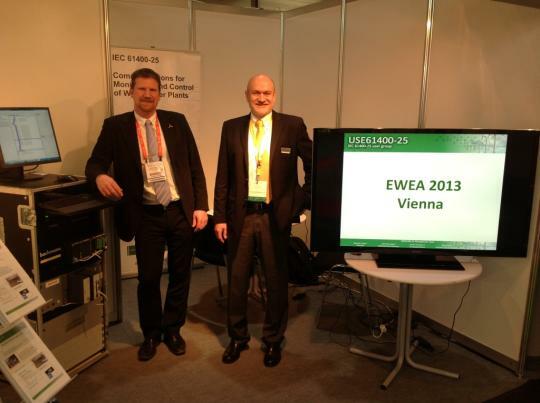 The user group was present at the EWEA2013 conference in Vienna, Austria. Bertram Lange (right), Chairman of USE61400-25 and Anders Johnsson (left), member of the management team at the USE61400-25 booth. The EWEA conference and exhibition took place during Monday February 4th to Thursday February 7th. As other years the USE61400-25 stand (B-J52) contained demoapplications and brochures and a screen showing material from several members. People from member companies took turn to represent the users group and tell visitors about how to use the standard.